“She said yes!” This was thrilling news for me. Not only were my son’s dreams coming true, but he had chosen a beautiful, wonderful girl who would be a loving, solid addition to our family. What mother of the groom doesn’t want that? 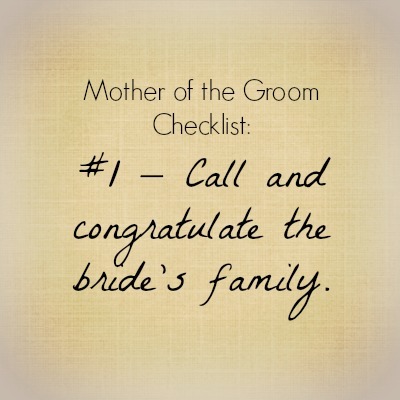 Item number one on the mother of the groom checklist is to call and congratulate the bride’s family. In my opinion, it is a fabulous idea to begin this journey with a relationship-strengthening celebration. Perhaps that means an engagement party. Usually the bride’s family hosts this, but if they don’t, it’s okay for you to throw this soiree. Optionally, consider inviting your son’s future in-laws to dinner, cocktails, breakfast, a ballgame — whatever is natural and appropriate for your family. An easy, friendly gathering is a great way to begin the process of blending the two families. Logistics, particularly distance, often make this impractical, but when it’s possible, it’s a wonderful way to show your son and future daughter-in-law your support. Ideally, this is an intimate, memorable gathering for the two families, including siblings. You’ll need a sturdy foundation for the coming months which, almost certainly, will deliver a challenge or few to everyone involved. Some kind of ice-breaking celebration will set you on your way to fun. Regretfully, I did not host the kind of gathering discussed here. The summer before, however, the two families met for the first time at a family cookout at our home. 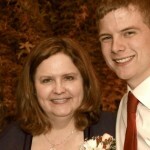 It’s a stretch, but I consider that a “done” on my mother of the groom checklist. The event was very similar to my ideal and the resulting bond carried us through to an amazing wedding 16 months later.